How I yearn for the days I spent waking early and sauntering out to the barn to tend to a few dozen lovely lady goats. I miss feeling the brisk air on my skin, the smell of sweet feed in my fingernails, and all those echoing-still morning noises that only happen before the sun fully rises. In another life I worked on a dairy farm in central North Carolina. Elodie Farms still holds some of the sweetest memories I can recall in my lifetime. The farm still stands today and is thriving more than ever. When I was an employee of the tiny Rougemont goaterie (I just made that little word up), I lived in the smallest of cabins imaginable. It was an old refurbished tobacco barn and I like to brag that we could see the sun rising through cracks in the logs. This place I so genuinely feel pride to have called home for a short period, was an immensely grand horse boarding farm. Those mysterious and massive animals would trot along the edge of the fence to say their good mornings to me on a lucky day. I spent many afternoons climbing up and reading atop a big old circle bale of fescue. Oh yes, this was the life. There were ponds to fish in, and deer to observe. There were trails and streams and frogs and flowers galore. The place was out of a storybook of the south. I promise you. And to make my life even more the better a short drive was all it took to arrive at my “workplace”. Milking these some 50 odd goats (at the time) is no small task I assure you. And at first I feared I had quite gotten myself in over my head. Those girls can push and shove like no other! And never mind the couple that had their horns still… But a few weeks of twice a day milking and I swear I felt like I had been doing it all my life. I can’t even describe the love I have for the owner, Dave. I feel like he is quite possibly my long lost (southern) brother. His kind soul just kind of oozes out through his giant hugs straight onto you. I miss that man. I miss those goats. I miss that job. So, I suppose yesterday when a mere little “farm day” on Oatland Island featured a trip to the goat stall, it was only natural I should reminisce a bit. Miles and I whispered about the different facts I could stir up in my memory about those bleating babes. We scratched behind their ears and fed them a little grain. In my minds eye, I was right back to jumping up onto milking stands, hauling cheese to the market, and drinking high life after a long hot day of true work. All I could think is that I wanted that again. Regardless of my desire to force my dear old husband to give up his job and join me in the business of goats, Miles and Rowan had a lovely time. Oatland Island Wildlife Center has been joyful each and every time we have gotten the chance to make it out there. Last time the focus was squirrels, next week is a mother’s day tea party, you know all the important things in life. Although these photos show two fairly sedated looking boys, I assure you they were just under the magic spell of a farm. I suppose their energy was unable to be caught on camera. 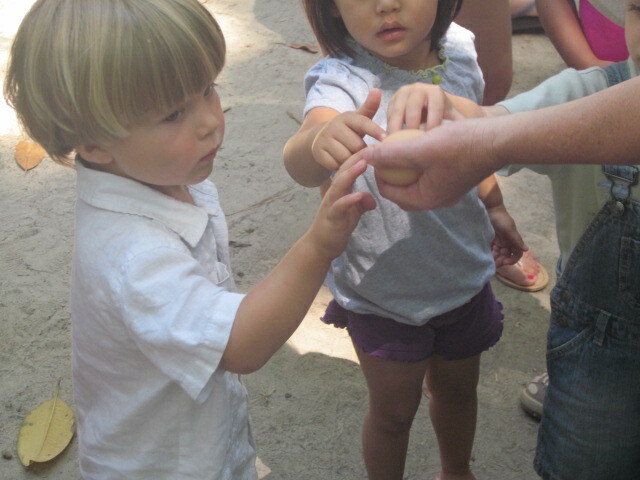 This entry was posted in adventures and tagged elodie farms, goats, oatland island, toddler tuesday. Bookmark the permalink. mariah write a BOOK you have the talent! and i so miss my girl . you have to say that! you are my mom! 🙂 thanks for the compliment though… I miss you!